Comments: Although less common in the northern and western parts of the Great Plains, Great Egrets have been found throughout the region in shallow, fairly open salt, brackish and freshwater habitats. 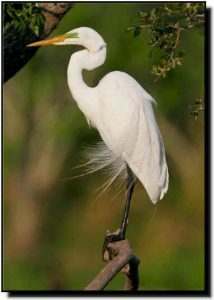 Great Egrets are distinguishable from other white herons by their large size, thin, slightly down curved yellow bill and long, black legs and feet. During the breeding season they develop long, white breeding plumes called “aigrettes” on the back. These filamentous plumes were highly prized by the millinery trade and led to the birds’ near extirpation in parts of their range.